In this free online guitar lesson I demonstrate how I play the guitar solo in “Hey Joe” by Jimi Hendrix. This example is suitable for intermediate level players who have learned pentatonic scale patterns. You can follow along using the free tools below including guitar tab and an audio mp3 of the performance. 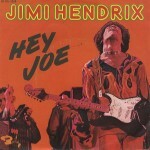 You can view and download my free Hey Joe Guitar Tabs here. Hey Joe is part of the pentatonic tabs that I have put together to help readers learn some of the songs I reference throughout my guitar theory courses. The file is just an interpretation of the solo and other pentatonic selections. You may only use it for private study, scholarship, or research. In addition to the video demonstration, I also have an audio performance of the part I play. This is a separate take from the video, so the performance may be slightly different. The use of the click track will help you hear when notes are on and off the beat. Hey Joe makes use of one of the the most popular scales in music, the pentatonic scale. 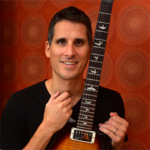 You learn all about scales and their use in my Fretboard Theory guitar theory program. I used a Fender Eric Johnson Stratocaster, staying in position 5 (the neck pickup). I plugged into a PRS Custom 50 amp head and used the lead channel with the following settings (12 represents 12 O’clock). Volume: 10 Treble: 12 Middle: 2 Bass: 10 Master: 8 Presence: 12. I added a plate reverb using an Alesis MultiMix8. The amp head was plugged into a Rivera Silent Sister isolation cabinet and miked with a couple of Shure SM57s. I use Dava Jazz Grips Delrin guitar picks. Desi, you are really sending out some awesome posts. It is really enjoyable to open up my email and find a new posting on the blog. Really keeps the motivation up, and gives me lots of material to work with. Hey Desi, these lessons are amazing I am 61 and have never learned guitar with such exuberance and enjoyment. As soon as I can I will purchase your complete course. Thank you & may God Bless you for the difference you make in people’s lives!